As I promised in the last letter, I will tell you my train learning experience on the 3rd, when I was leaving Katsuta for Iwaki. I had managed to buy a ticket the previous day for the Limited Express "Fresh Hitachi" train and acquired a receipt so I could get reimbursed. I also made a point of arriving early and upon the advice of my Trainer I picked a location that seemed to match up with where car 6 or 7 of the train would stop. There are car number designations posted overhead along the platform. You have heard that the trains run on time here and that is very true. They leave and arrive on the scheduled times and if there is any discrepancy at all it is probably because of your watch. Well, at the scheduled time, or slightly before, an Express train arrives but it has To Katsuta in the car windows. It sits at the platform a minute as I wait for them to change the signs in the window but the train splits in half with the first 6-7 cars leaving the platform. As I look down the platform at the remaining half of the train it finally registered in my slow working mind what was happening. The train to Iwaki was now sitting at the far end of the platform and the musical tones that they play to announce a departure was playing. I did not have a prayer of making it to the other end of the platform lugging a medium sized bag and my backpack. So I stood there on the platform cussing myself for some kind of fool and watched my Limited Express go by on its way to Iwaki. The good thing is that there was anther Local that left in about 10 minutes and I was able to board that one successfully and arrived in Iwaki about an hour later than if I had caught the express. This gave me an opportunity to learn what the procedure is to do a fare adjustment and get the receipt changed. This, and everything else, is being accomplished with a lot of sign language on my part and a little English on the part of the Japanese. It has been possible so far to function but I do not know for sure what I am going to eat most of the time when I am in a restaurant. They do have a lot of prepared meals in the convenience stores, 7-Eleven and others. As well as the large Department stores (these all have restaurants and grocery department). 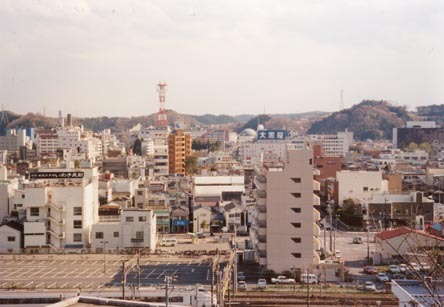 Iwaki is the second largest town in the Tohoku Region, the northern third of the main island. Its claim to fame within Japan is that it is the largest city in land mass at about 1,200 Sq Km. 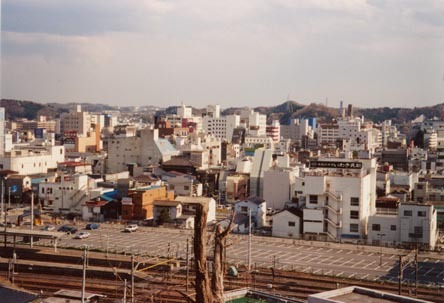 It is comprised of the metropolitan area and a number of connected towns that have now almost all merged together (if I tell a local that I live in Iwaki they ask again where I live; so I live in Taira a part of Iwaki). It is approximately 200 Km north of Tokyo on the Pacific. I do not know a lot more about the town itself yet but one of my students said that it has the second largest container shipping port in the country. The area is surrounded by high mountains to the north and west (maybe 10-15 miles away) that gradually decrease in height as they reach the sea. Within this half circle are the towns. There are some lower dividing hills and river channels throughout the area. These two pictures are of downtown looking toward the south. I took them from Ryugajo Hill, Dragon Castle Hill, the hill that I must walk around or over every day to get to work. At one time it had a castle that stood about where I was when taking the pictures. The tower that you see in the picture is on top of the NTT (the national telephone company) building where I have access to the Internet. When I was told that my site had been changed from Hitachi to Iwaki the recruiter in San Francisco said that my apartment would be on a hill. What he really meant to say was that my apartment was on the other side of a hill from my work site. It is about a 25-minute walk to work every day but when I add in the time to get to this e-mail location it is 35. Then there is the added walking around in search of a restaurant or convenience store for dinner. This is one of my routes over the Hill. 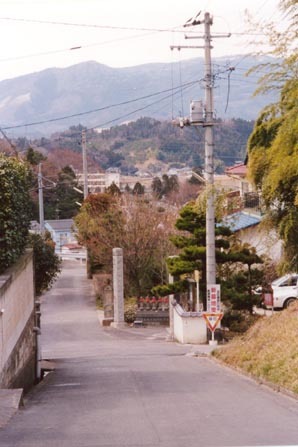 Near the center of the picture on the right side of the road is the entrance to a temple. The picture on the right is a closer view of the entrance. The white barked tree with many trunks is a Japanese magnolia that had many beautiful flowers in early spring, sorry I didn't get a picture. I have not put my bike together yet but sure need a commuter bike to get around. There are thousands of them parked at the train station and all over town. These are one speeds with a rear disk brake and front side pulls, a plastic basket that is about 18x18x9" is on the front rack, a back rack and a front wheel generator with head light. Theft in Japan is relatively rare with one exception - bicycles. One of my roommates (I have two, both from Australia and both named Dave) had one stolen after he had it less than two weeks. Therefore, I will not be using my touring bike for a commuter! One of the Daves said another Aussie had brought his very good mountain bike with him and it got "pinched straight away". That is it for now. I will be telling you about the work in my next letter. Very busy trying to learn my job and do it at the same time! 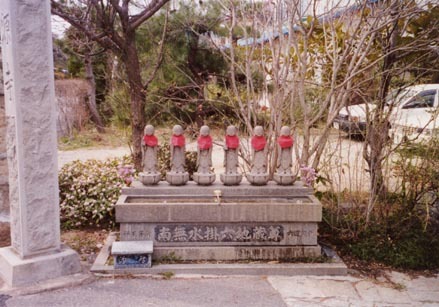 Comment: I have added this to the original letter as a place to post the pictures of sculpture that I have seen in Taira while living here. In my many walks I have passed some of them almost everyday whereas others I noticed and then made a point of going back to get a picture (I rarely carried my camera with me unless I had a photo in mind). I believe these pictures need no captions or for some of them I'm at a loss for words. I did notice that none of the other towns/cities that I visited in Japan had such a profusion of street sculpture. Considering how small (for Japan) Taira is I find it a unique charm of the town.